Suarez and Messi have drawn level with Real Madrid on league goals scored. 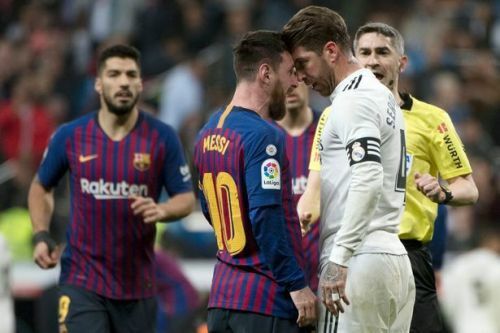 Following Barcelona's 3-1 win over Rayo Vallecano in LaLiga, Lionel Messi and Luis Suarez have drawn level with Real Madrid on goals scored in the league. Real Madrid have scored 43 LaLiga goals so far this season; the same number of goals scored by the duo of Messi and Suarez. Leading the race for European golden shoe, Lionel Messi scored a first-half penalty in the game against Rayo Vallecano, taking his tally to 26 league goals this season. Later in the game, the Uruguayan sharpshooter, Luis Suarez, netted his 17th goal of the season. So far, they have now scored 43 goals between them. On the other hand, Real Madrid, who've struggled to score goals since Ronaldo's departure to Turin, have scored the same number of goals as the Barca duo. Following their third successive Champions League triumph, Zinedine Zidane shockingly resigned as the head coach of Real Madrid followed by the club's highest ever goalscorer, Cristiano Ronaldo, who joined the Italian giants Juventus after having spent nine seasons at the Spanish capital. Since then, it has been nothing but misery for the 13-time European champions. Following a dreadful start to the season under the helm of Julen Lopetegui, Los Blancos lost the UEFA Super Cup at the hands of city rivals, Atletico Madrid. After the constant defeats in LaLiga, the inevitable had to happen as the former Porto coach was sacked to be replaced by Santiago Solari. Since Santiago Solari took over, there was an upturn in some players' performance. However, it didn't last long and it wasn't enough to get them something out of their awful season. Having crashed out of the Copa del Rey and UEFA Champions League, they now occupy the third spot on the league table - 15 points adrift of the leaders and arch-rivals, FC Barcelona. With the hope of returning to the winning ways, Solari's men will take on Real Valladolid, away from home, on Sunday.